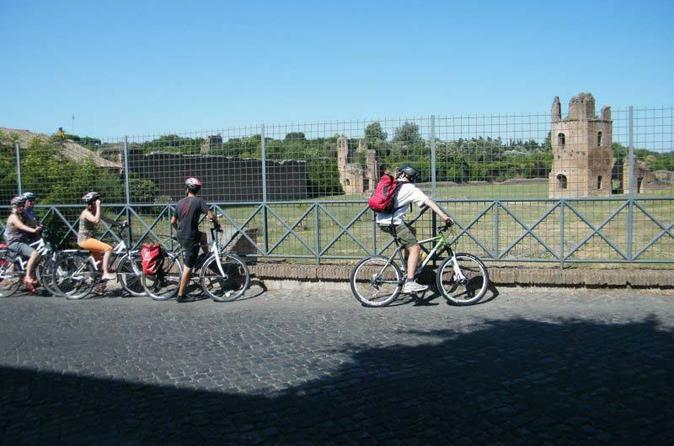 Today we did a private 6hr Appian Way plus highlights bike tour with Bram. We really enjoyed the tour and everything that was included!! Bram was an excellent, highly knowledgeable, passionate, professional, a kind person and terrific tour guide. We really enjoyed his company and all that he did and told us along the way! He always put our safety first and consistently checked in on how we were doing the whole way. Once again, thank you Bram and to whom else was involved in the preparation of our tour today!! My husband and I love to go on bike excursions on trips. It gets you seeing a city or countryside with a different pace, enjoying all senses. We had been to Rome seeing all the highlights once, so this tour appealed to us. The catacombs, and getting an appreciation of the layout of the city was great. We did this on a day in October with mild temperatures and sunny skies.This was a good tour, but needs some caveats. The roads in Rome are congested, which is no real surprise, but it takes good nerves to navigate initially. The Appian Way is OLD, with smooth stones, and maintaining control can be difficult. The trip also takes you over fields with uneven surfaces. The write-up does little to allude to the challenges (a small sentence suggests that we are "excellent mountain bikers"), and I would not recommend for children under 14. Miriam proved to be an excellent and patient tour guide. The group was of mixed abilities but everyone bonded and had an excellent day.This was the 6 hour tour but overran but quite a bit, however Miriam remained upbeat and patient with us.The tour took in so many aspects of the Apian Way including a stop at some catacombs and a farm. We were given a lot of historical information which brought it all alive.Sadly, due to a health issue, I had to drop out towards the end of the day. As a result Miriam organised a taxi to pick the two of us up and for a couple of her colleagues to collect the bikes. I couldn't thank her enough for her support.The ebike option did make the trip a lot easier throughout the day.A trip worth taking. This was probably our most favorite tour in Rome. 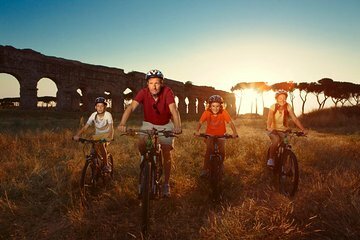 The bikes worked great, the guide spoke English (that you could understand) and he shared some interesting facts about Rome and the aqueducts. We recommend highly! One of the best parts or our time in Rome. Got to see some interesting ruins, learned some history, the Aqueducts were as incredible and impressive as anything we saw. The electric bike assist is awesome and made the trip very fun. Some of the trail is challenging but really a beautiful ride. So glad we booked this. Easily one of our favorite things in Rome .And our 2 guides were great. What an amazing way to finish out trip to Italy. I can't even describe everything we saw, every time we stopped we learned something new, and saw something beautiful. Our guides, Emanuellel and Jahn ? went above and beyond! Thank you so much for a fabulous day! Para aqueles que estão lendo e ainda têm dúvida se fazem ou não: FAÇAM!!!! É incrível. A empresa de Bikes que opera o passeio é excelente e muito profissional. Eles têm equipamentos novos e os guias são ótimos (destaque para a guia Helena). São 6 horas de passeio, passando por lugares nunca imaginados em Roma. Uma delícia. Nota 1.000. Farei novamente em outras oportunidades. Fabulous! Don't miss this incredible 6 hour tour away from the crowds and hustle and bustle and yet full of fascinating Roman history. This was one of my favorite experiences in Rome - the countryside. Perfect blend of riding and commentary! Fantastic experience! Highly qualified guide who led us through the city to the Appian Way. Excellent activity! Highly recommend this tour. Our tour guide, Lorenzo, was wonderful and knowledgeable. He was very kind and considerate of our safety while riding bikes in the busy streets. We had a fabulous time! It was one of our favorite experiences in Rome!